Play Your Game and Eat It Too! There are times when the long hours of work on The Chess Drum pays off! Besides the numerous e-mail from around the world and other kind comments, there are also kind gestures. However, nothing could've prepared me for the surprise I received this past weekend at Richard Crespo's Peach Open in Atlanta, Georgia. During the 2003 World Open, I sold t-shirts to a number of Chess Drum patrons and at the tournament's end, I decided to save two large shirts. 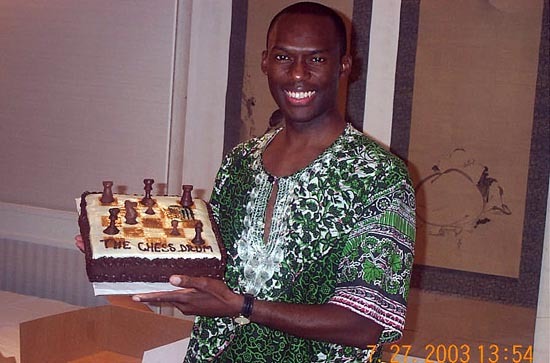 Upon returning to my residence in Florida, I received an e-mail from Mrs. Kay Umeakunne of Atlanta who happened to be interested in purchasing two large Chess Drum t-shirts! 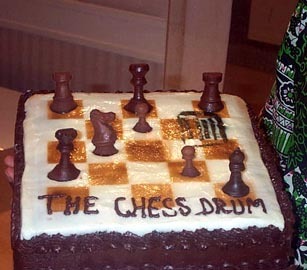 If you played chess as good as this cake tasted, Kasparov would be REAL nervous! Before she was able to mail the amount to me, I e-mailed her and told her I would attend the Cajun Chess tournament in Atlanta and would be able to deliver the shirts to her in person. On Saturday, I was wearing the Chess Drum t-shirt, so when she saw me, she introduced herself. This proud wife and mother was very pleasant and had a humble demeanor. However, she showed her motherly pride when introducing me to Chima Umeakunne, her cheerful son and budding scholastic star. Mrs. Umeakunne has been an active organizer in Atlanta scholastic chess and recently organized and hosted a chess camp at her church which was taught by IM-elect Stephen Muhammad. She proudly showed me a beautiful photo album from the event and the 26 children who attended the camp. Everyone seemed to have a great time and she praised Muhammad's work. For the event, she made a chess cake for the participants and of course, kids and cake get along very well! Mrs. Umeakunne thanked me again for bringing the t-shirts. "I told a player it would be hard to eat such a beautiful cake, but once I took my first bite, eating it wasn't hard at all!" On Sunday, after my grueling 4th round draw against Eddie Santana, I analyzed it with a group players. Mrs. Umeakunne was waiting patiently nearby and after we were done, she approached me. She told me she had made me a cake and gave me the box. After opening the box, the sight of the chess cake was unbelievable… the chocolate chess pieces laid delicately across the textured icing. She showed me the ingredients (which I will not reveal), but this was a special cake because it was "vegan" which meant it did not contain any dairy or eggs. Sometimes chess players want to "have their cake and eat it too" when pondering a chess position, and this time, we actually got to do it! I told a player it would be hard to eat such a beautiful cake, but once I took my first bite, eating it wasn't hard at all! The taste was absolutely scrumptious and had the rich texture and quality of a gourmet cake at a five-star restaurant. All the players who tried a piece gave rave reviews. Issac Hinch of Atlanta said it was the best cake he ever had. This day we certainly had our cake and ate it… a special cake!! One I will never forget. Heartfelt thanks to Kay Umeakunne for such a kind gesture! Daaim Shabazz is a "happy camper" with this cake.